Picked up a card in-store? Before you can redeeem points, you'll need to register. Not a member of DIY Rewards? Sign-up here, it's easy and free! Introducing your card to go hard. 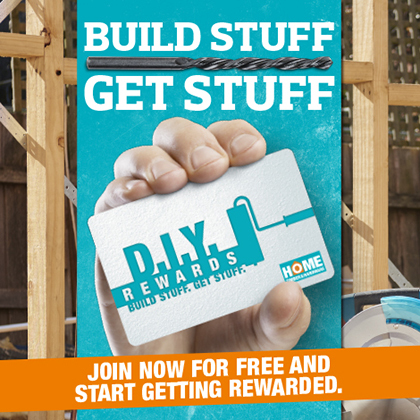 DIY Rewards is our rewards program available at participating Home Timber & Hardware stores. It’s simple, when you build stuff, you’ll get stuff – 5 points for every dollar you spend, redeemable for any gear you want in your nominated store. How do I become a DIY Rewards member? Join up at the counter, or online using the link above and start collecting rewards straight away. Contact your local store to see if they’re a DIY Rewards store. How do the DIY Rewards work? Doing the work ain’t easy but redeeming points is. Just present your DIY Rewards membership card every time you make a purchase at your nominated Home store. Your purchase is recorded onto your membership card, every time it’s scanned, you’ll receive five points for every dollar you spend in store. *Conditions apply. Keep track of your points with your secure DIY Rewards account online. Once you have accumulated 500 points, you can redeem them on purchases, but only at your nominated store. Show your membership card so we know you deserve extra special member benefits. You can keep track of your rewards on this website. Simply click the ´member´ icon above to log in. There you will enter a Member ID and Password. Use your membership card number/barcode as your Member ID and your surname as your password the first time you log in to check your accounts. If you have questions about DIY Rewards or to find out if your local store is a DIY Rewards store, click here. To view the full Terms and Conditions click here. Sign up to DIY Rewards Now!